Congratulations, you're a manager! Of course you have expertise in the field you're managing, but what about everything else? There's so much more to know! Whether you're a new or seasoned manager, your responsibilities can become overwhelming at times. There are days and new situations that will leave you feeling vulnerable. You don't know where to start or even what to ask! Getting started: moving from peer to manager, setting goals, managing projects, resources, and much more. Developing your management skills: communicating, delegating, motivating, and facilitating. Building and managing your team: hiring, firing, and everything in between. Creating your personal brand: building credibility for yourself, your team, and your department. Managing up, down, and around: working with people and functions in your organization. Potential land mines: conflict, change, and risk. Legal pitfalls: navigating the miasma of laws and regulations. 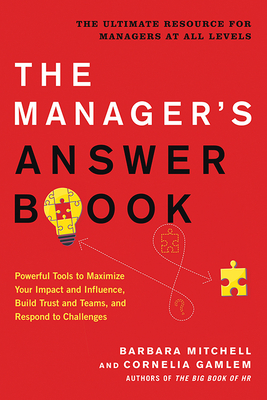 The Manager's Answer Book will help any manager stay informed and avoid unknowingly tripping over a new situation. It's a natural complement to The Big Book of HR.